It is rare to find scenes that can express a complex reality or major issue, but one such was some video footage leaked recently, which exposed part of the heinous interrogation of a Palestinian child. Ranking officers in the Israeli occupation security services tried to overpower a 13 year old boy, break his will and crush his dignity. ____The astonishing video shows the impressive resilience of the Palestinian people, represented by this child from Jerusalem. 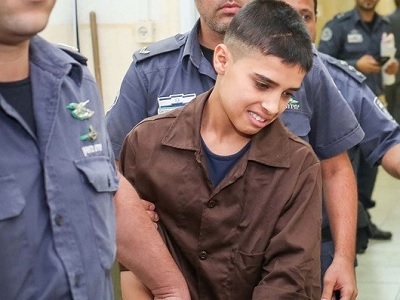 The boy, Ahmed Manasrah, remains strong, unwilling to break, no matter how much the Israeli officers aggravate him with moral and physical pressure. HEBRON (Ma’an) – Israeli troops on Sunday forced a Palestinian family off their agricultural land during an olive harvest for the second time in two days, a popular committee spokesperson told Ma’an. ___Muhammad Ayyad Awad said Israeli troops forced Hammad Abdul-Hamid Sleibi and his family to leave the family’s olive fields on the outskirts Beit Ummar, in the southern occupied West Bank district of Hebron. ___Sleibi said that security guards from the nearby illegal Israeli settlement of Bat Ayin first arrived to tell the family to leave. The security guards allegedly pointed their guns at the family and threatened them, telling them not to come back to the area. ___The family refused to leave their land, and Israeli forces soon showed up to the scene and shot tear gas and stun grenades at the family, forcing them to flee. 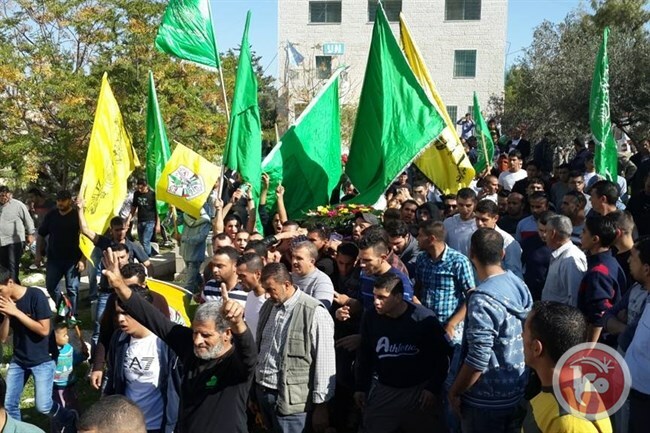 HEBRON (Ma’an) — Thousands of Palestinians gathered in the Hebron and Ramallah districts of the occupied West Bank Saturday for separate funerals of Palestinians shot dead by Israeli forces during clashes. ___Near Hebron, mourners carried the body of Hassan Jihad al-Baw, 23, whowas shot in the heart on Friday in the town of Halhul and killed immediately, medics told Ma’an at the time. ___Meanwhile in the Ramallah-area town of Budrus, mourners buried Lafi Yusif Awad, 22. ___Awad was shot and killed by Israeli forces during clashes in the town Friday after the Israeli army said he attempted to grab a soldier’s weapon. At the 1992 Earth Summit the governments of the world agreed on a new agenda for sustainable development. This agenda included a bold new Convention on Biological Diversity (CBD) which calls on governments to establish systems of protected areas and to manage these in order to support conservation, sustainable use, and equitable benefit sharing. . . . Nature Reserves are places for people to get a sense of peace in a busy world; places that invigorate the human spirit and challenge the senses. The Palestinian Nature Reserves (NRs) harbor a rich base with many species. When applying the precautionary principle for the analysis of Key Biodiversity Areas (KBA) on the Palestinian NRs, we find numbers of them identified as KBAs, which highlights the outstanding biodiversity value that is represented by the Palestinian reserves. From the beginning of the month of October 2015, the Palestinian territory witnessed a systematic war carried out by the Israeli Occupation Army and settlers living in the illegal Israeli settlements in the occupied Palestinian territory. The confrontation began between the Palestinians, who have the right of the land, and the Israeli Army and their settlers, who have nothing unless the military gear. . . The thuggish operations of the Israeli army match very closely the criminal behavior of the country’s political authorities. The undercover raid of the Palestinian al-Ahli hospital in Hebron by about a dozen IDF operatives in disguise on November 12 resulted in the killing of 27-year-old Abdallah Shalaldeh and the arrest of his cousin Azzam who was being treated there. From: THE PALESTINIAN WEDDING: A BILINGUAL ANTHOLOGY OF CONTEMPORARY PALESTINIAN RESISTANCE POETRY. Ed. and Trans. A. M. Elmessiri. Boulder, CO: Lynne Rienner Publishers, 2011. Reprint from Three Continents Press, Inc., 1982. ―Available from Palestine Online Store. Also in: Palestine-Israel Journal of Politics, Economics & Culture. Vol.14 No.1 2007. 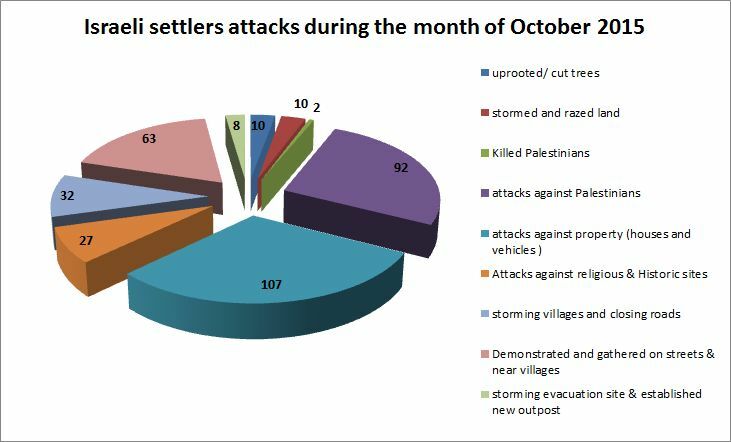 Graph: Monitoring Israeli Colonization Activities in the Palestinian Territories, Oct. 11, 2015. What an appallingly sad story of Ahmed Nanasrah. Is he still in custody? What is known of the outcome of the video being leaked? Watch here for the answers to your questions. At this point I do not know.